A copy of this book was provided the author in exchange for a review. $2.99 Kindle, not available for Nook at this time. 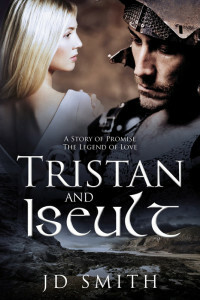 The story of Tristan and Iseult is a well known classic myth. Although it is commonly cited to originate from 12th century French poetry, it's roots actually stem from Celtic folklore. It has been the inspiration for many myths and stories since its first publication. It shares many of the same characteristics as the Arthur/Guinivere/Lancelot love triangle, and in fact, many scholars say it was the basis for that story. One of the most well known versions is the Wagner Opera of the same name, which debuted in Munich, Germany in 1865. J. D. Smith's recently published adaptation is a delightful read. She has a way of telling the tale that makes you really feel empathy for all of the characters involved. At one point, the pain and longing of Tristan, Iseult, and yes, King Mark almost brought me to tears. The story is told through chapters that alternate between Tristan's view of things and Iseult's. I really like when author's use this device as I like seeing and feeling how the different characters feel about the same events. If the story had any drawbacks for me, it was that it was too short. The book consists of only 220 pages and is easily readable in one sitting.